Do it big! Do it right! Do it with style!” These are the words of dance legend Fred Astaire … and this is the energy that ignites our stage. Back by popular demand for a third year in a row, “Ballroom Extravaganza” brings a fresh, new show to the Emelin for one very special night. “Ballroom Extravaganza: Dancing through the Decades” will delight audiences with style, sweetness and sass, as performers bring Fred Astaire’s legacy to life. Exploring the evolution of ballroom dance, performers bring their unique passions and perspectives to the stage. 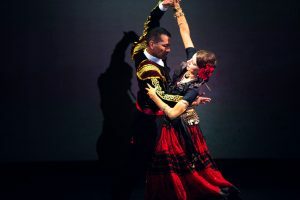 Because dance is intimately related to music as a source of expression, familiar dances – such as waltz, foxtrot, rumba, salsa, cha-cha, tango and swing – will evoke the energies of distinct moments in time. However, history is not just historical – so expect this journey through the decades to come alive. Choreography, created especially for this show, plays with diverse dynamics to give each number an exciting modern flair. Supporting the inclusive spirit of the arts, “Ballroom Extravaganza: Dancing through the Decades” showcases collaboration among professional dancers and trained amateurs from Fred Astaire Dance Studio Mamaroneck. Accomplished and polished numbers will not only provide an evening of beautiful entertainment but also demonstrate an impressive range of student accomplishment. The show’s professional stars include Kateryna Angelone, Stanley McCalla, Arsen Sargsyan, Paula Paz and Vincent Coliccio. Bringing more than 40 years of combined experience to the stage, Angelone and McCalla are renowned dancers, titled in National and World Championships. They own the Fred Astaire Dance Studio Mamaroneck and are highly sought as instructors and coaches. Sargsyan, a former soloist in the Armenian National Ballet, is recognized as a top performer and teacher in the region. Sargsyan, Paz and Coliccio are instructors at the Fred Astaire Dance Studio Mamaroneck. “Ballroom Extravaganza: Dancing through the Decades” delights and excites with the magic of dance – and so much more. According to Angelone and McCalla: “As we do it big, do it right, and do it with style … we also say, ‘Let’s do it together!’” Don’t miss this spectacular show!